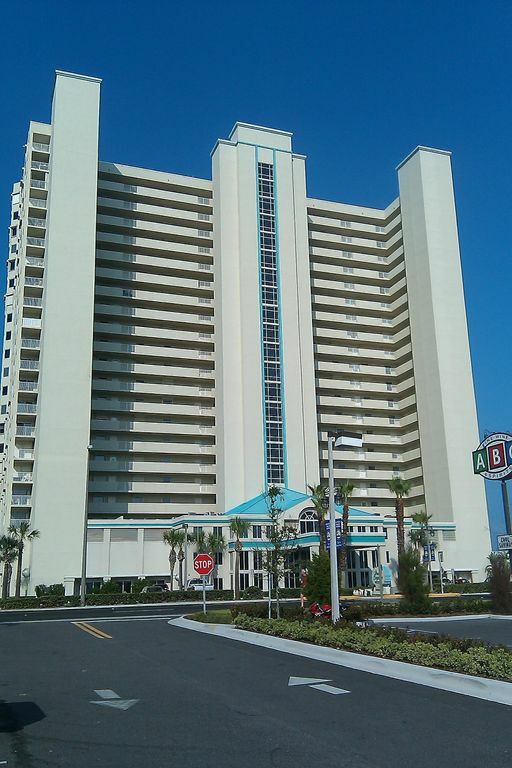 The Grand Coquina is a luxury 22 story oceanfront condo that is elegant inside and out. This three bedroom, three bath direct oceanfront condo is located on the 6th floor and is furnished by an interior decorator and provides magnificent views and ocean sounds as well as privacy. This very spacious condo (in excess of 2000 sq. ft.) has a large private balcony with comfortable patio furniture that is accessible from the living room, dining room and master bedroom. The spacious master suite has a shower as well as an over-sized bath tub/shower, walk-in closet and separate his/hers areas with separate sinks and mirrors. Our condo is very well-maintained and has underground secure parking, an indoor and outdoor pool, secure access to building and secured beach access. The large, fully-equipped kitchen has granite countertops and a breakfast nook with a table and four chairs as well as a large center isle with bar stools. There is also a very beautifully furnished dining area. This condo has broadband internet service and free phone calling in USA, Canada and Puerto Rico..
Beautiful oceanfront with grand private balcony as well as an indoor and outdoor pool. Indoor pool and outdoor pool, exercise room and library. Outdoor pool is on the south side of the building allowing sunbathing all day. There is parking inside the building as well as parking on the outside of the building. Beautiful kitchen with contemporary cabinets, granite countertops, stainless steel appliances and kitchen nook. Spectrum Cable with DVR. Records up to 6 shows. DVD player works well with TV. Free Library on 2nd floor of building for tenants. There are also several books in the condo that may be read. Large private oceanfront balcony with nice outdoor furniture. Boats are available to rent in the area. Deck made of pavers around the outdoor pool area. Saunas in the men's and women's bathroom by the indoor pool. There is an indoor heated pool as well as an outdoor heated pool. The outdoor pool is on the south side of the building allowing sunbathing all day. Had a very enjoyable stay at your oceanfront condo in Daytona. The condo is very nice and has everything we needed for a very enjoyable stay. The furniture is all in excellent condition. The kitchen is very well laid out. The balcony is great! The bathrooms are all well-stocked right down to Air Freshener. Gary was very accessible, which is also very important. We sent an e-mail and he answered right away. We would not hesitate to book this condo again. We have been staying at this property for about eight years and still love it! Daytona Beach Shores is the part of the beach we love and Grand Coquina is in a prime location on this part of the beach. Condo is furnished comfortably and has a great balcony. Indoor pool and hot tub are an added bonus. Thank you for writing a review of our condo and greatly appreciate how well you take care of our property. We hope you will return again next year! Nice and spacious condo with a big oceanfront balcony . Owners Gary and Theresa are very friendly and hospitable. Inventory is more than full, and also entertainment (dvd, books). Service personel are friendly and helpfull. The building is clean and quiet. Restaurants en supermarkets are nearby. We enjoy our stay very much and will certainly stay here again. Diane and family from Holland, Europe. Diane and family are very nice people. They are very responsive to communication and easy to work with. They took good care of our condo. I hope they will return again soon. My wife and I have rented this condo several times over the last ten years and we absolutely love it. We have already booked for the spring of 2017. The condo is beautifully furnished, very spacious for 1-3 couples, quiet, clean and has a great view from the balcony of the ocean and beach, especially at sunrise. The condo is located conveniently to restaurants and attractions. The pool area is clean, relaxing and has a great ocean view and private access to the beach. The condo has a well-run association group and we have met several good friends there over the years. We would recommend this condo to the 55+ crowd. My family and friends have been vacationing at Daytona Beach for ever, and we've stayed in numerous condos on the beach. Several years ago we were fortunate enough to find this condo, and have rented it for a month every summer since. It's perfect for us for many reasons... the great price, very spacious, the huge eat-in kitchen, the awesome huge balcony, and location, location, location! Also, love the full-time residents, manager and staff of the property. It's our home away from home! we have rented from the owners for the past 10 years this condo was the nicest yet. all furnishings were beautiful. the condo was clean and well taken care of. We liked the location for convience. I loved the pool location and the beauty as well as the shade of the palm trees. The on property management were very nice and accommodating.Already booking for 2016.